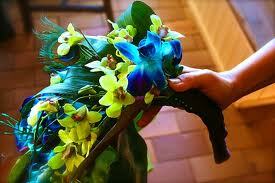 Bridal bouquets have evolved to become one of the most important part of a brides look on her big day. Your bouquet is a vital focal point during your wedding ceremony. This one item, will be one of the most memorable parts of the brides image on her wedding day. 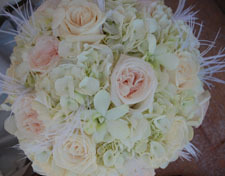 Before you choose the flowers you want to carry on your big day, just what do you need to know about bridal bouquets? Many brides choose wedding bouquets with a timeless flower like the rose, and tend to keep the design fairly simple. Don't confuse simple with boring, these types of wedding bouquets actually deliver quite a bit of wow factor, even when using just a single flower type. 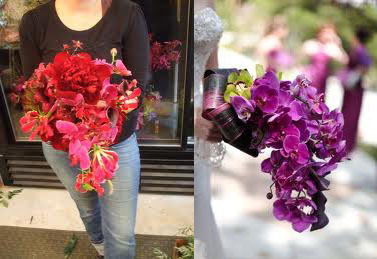 The quality of the flowers is the most important aspect, so choose a good florist who will know best how to prepare and preserve the flowers you'll be using for your bouquet. Cascade Bridal Bouquets Bring the Drama! Lots of brides may look back in horror at those eighties style cascade bridal bouquets, with their profusion of baby's breath, leather fern and carnations. They often looked like a big mass of fluff, and not like flowers at all. Today's cascade designs however are much more refined and vastly more sophisticated than their eighties predecessors. Use flowers already naturally suited to this design for the best, most flowing result. Orchids are the absolute first choice for most florists, for a variety of reasons, but they can be expensive, so shop your options. You can also get a lot of mileage out of the right filler. Large, long and dramatic Ti leaves make a great addition to cascade wedding bouquets because they can be folded, and shaped in many ways. They are versatile enough to use in any theme bouquet, and they are available in a striped variety and several different shades as well. Many modern wedding bouquet designs use a single type of flower, in a classic round bouquet. Calla lilies or roses are some of the most elegant flowers you can use, and are often chosen for this type of bouquet. Calla lilies, with their elongated single bloom and lengthy stems are also perfect for an arm sheath wedding bouquet, but the round shape is truly a classic and a good fit for most flower types. For a round shape, use a single type of flower like a rose, in varying shades, for instance deep tangerine to light peach tones. Casa Blanca lilies which are wide and will fill out the spherical look you are going for, and make a nice compliment to roses and daisies especially. Tie together and wrap the stems with floral tape, for a beautifully polished look no one will know you did yourself. You can also get a lot of mileage out of the right filler. Large, and long leaves provide a dramatic effect. Ti leaves make a great addition to cascade wedding bouquets because they can be folded, and shaped in many ways, and palm fronds can be used just as easily. Other non-floral elements like stalks, branches and berries make excellent fillers for your wedding bouquets as well, and can really help tie in a particular theme. 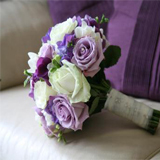 Not a fan of traditional bridal bouquets, or want to add just a touch of something different? Add a special element to make your wedding bouquet extra glamorous and amazing. Every bride wants to shine on her big day, so when all eyes are turned on to you, why not try an eye-catching burst of color with a jeweled accent like bouquet charms, crystals or brooches. These are easy to add to your own bouquet, but any florist will be happy to add them for you. 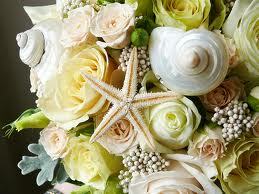 For a beach themed wedding try ornate shells, or starfish. Your bouquet will look amazing as you walk down the aisle, not to mention the beautiful pictures of your bouquet, that will last forever. 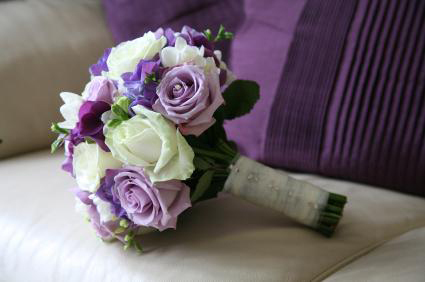 Want more ideas for beautiful bridal bouquets?